Image by Bill Parsons, from here. Sometimes it seems that there is nothing that is so bizarre that some organism does not do it. Life at temperatures that approach boiling? No problem. Male-only species? We can do that. Or is this what you had in mind? But sometimes something comes along that makes one think, "Diversity of life is all well and good, but that's just stoopid". Case in point - Thalassocnus, the marine sloth. Like the recently covered Odobenocetops, Thalassocnus hailed from what is now the west coast of South America. Indeed, as the Miocene to Pliocene time range of Thalassocnus includes that of Odobenocetops, it is entirely possible, if not probable, that the two of them could have bumped into each other on a regular basis. Though it persisted for some four or five million years with five species described from successive time periods, Thalassocnus seems to have always had a quite restricted distribution. It has only been recorded from the Pisco Formation on the southern coast of Peru (de Muizon et al., 2003). Though the idea of a marine sloth seems at first quite illogical, sloths are actually quite adept swimmers. The coastline along what is now the Pisco Formation was a barren desert at the time that Thalassocnus inhabited it (de Muizon et al., 2004a), which would have meant that the only food source available to the herbivorous sloths would have been seagrasses and seaweeds growing offshore. Earlier species of Thalassocnus show a high degree of wear on their teeth caused by chewing lots of sand with their food (de Muizon et al., 2003b), suggesting that Thalassocnus started out collecting plant matter washed onshore, or feeding in close enough that swimming would have brought sand into suspension. As time progressed, Thalassocnus would have ventured further and further out. Later species show almost no sign of sand-induced wear, indicating that by that time they were feeding entirely aquatically at some distance from the shore. This figure shows the lower jaws of all five Thalassocnus species from the oldest (T. antiquus) on the left to the youngest (T. yaucensis) on the right. Note the progressive lengthening and change in shape of the end of the jaw, which de Muizon et al. (2004b) suggest was related to the development of thick muscular lips for collecting seagrasses. Later species also showed adaptations for a grazing rather than browsing feeding mode. One aquatic adaptation that is notable by its absence is that even the later species of Thalassocnus show no sign of pachyostosis, thickened and heavy bones as found in other aquatic bottom-feeders such as sirenians. This is a curious deficiency in regards to Thalassocnus' probable lifestyle. If you have ever tried to sit or lie on the bottom of a pool, you would have noticed that staying submerged requires continuous and quite strenuous effort, as the body tends to float to the surface. Most bottom-feeding aquatic vertebrates evolve denser builds to remove this requirement. De Muizon et al. 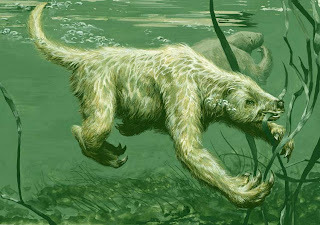 (2004b) suggest that instead of evolving greater density, Thalassocnus used the enlarged claws it retained from its sloth ancestry to anchor itself to the bottom. They compare it in this regard to the seaweed-grazing marine iguana (Amblyrhynchus cristatus), which also has enlarged claws. Such claws would have also aided Thalassocnus (as they do the iguana) in clinging to rocks when entering and exiting the water, even in the presence of heavy surf. Thalassocnus must have been a remarkable animal to see in life (image above from here). However, this brings me to question what exactly it did look like in life. Sloths have a reputation for being decidedly shaggy animals, and most extinct ground sloths are reconstructed with similarly long, flowing hair. However, such a pelt seems poorly suited for an aquatic lifestyle, and so unlikely for Thalassocnus. Many aquatic mammals, such as cetaceans and sirenians, have almost entirely lost their hair in favour of an insulating fat layer. Others, such as sea lions and the sea otter (Enhydra lutris), have evolved a dense pelt. Personally, I find it easier to imagine a sloth with a pelt, albeit a shorter one than its terrestrial relatives, than an entirely naked sloth, and point out in my support that the pelted marine mammals include a higher proportion of those that divide their lives between land and sea. Still, barring remarkable good fortune, either option must remain entirely hypothetical when dealing with an extinct animal. Muizon, C. de, H. G. McDonald, R. Salas & M. Urbina. 2003. A new species of the aquatic sloth Thalassocnus (Mammalia, Xenarthra) from the Late Miocene of Peru. Journal of Vertebrate Paleontology 23 (4): 886–894. Muizon, C. de, H. G. McDonald, R. Salas & M. Urbina. 2004a. The youngest species of the aquatic sloth Thalassocnus and a reassessment of the relationships of the nothrothere sloths (Mammalia: Xenarthra). Journal of Vertebrate Paleontology 24 (2): 387–397. Muizon, C. de, H. G. McDonald, R. Salas & M. Urbina. 2004b. The evolution of feeding adaptations of the aquatic sloth Thalassocnus. Journal of Vertebrate Paleontology 24 (2): 398–410. 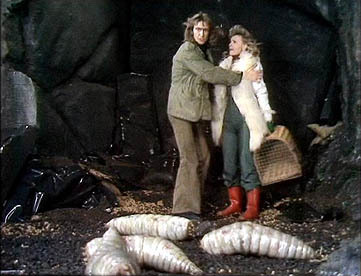 I've never been a fan of the shaggy coat on marine sloths, either. I've never tried to restore one (although I might now that you've provided a skeletal mount) and I would give it short pelty hair too. This was probably an animal that came ashore often, only diving into the depths when the rumbling of the belly encouraged it. Nicely done, Chris! I actually have been meaning to do a repost on something I wrote about these sloths last year, but it looks like you beat me to it. Incredible. I have difficulty imagining a sloth in cold water. Marine iguanas sunbathe extensively after feeding. Tree sloths are very temperature sensitive metabolically, manatees are also. Maybe the marine sloth fed on seagrass in shallow calm sun-lit estuaries? The lack of very dense bones does fit with claws for grasping, perhaps also used for shore burrowing. Lowland gorillas at Ndoki marsh use their fingers to rake floating water plants. The Peruvian marine otter feeds on seafood while backfloating, sleeps in a shore burrow, it has a thick pelt and doesn't sunbathe ashore. The terrestrial environment alongside Thalassocnus' range was extremely arid at the time, with probably next to no vegetation. And no shallow calm estuary either - as it said in the post, these animals were feeding some distance off shore. Considering the upside-down feeding of tree sloths, the backfloat feeding of Peruvian marine otters, the lack of pachyostosis in the Peruvian marine sloth and the gradual translocation of feeding to deeper waters, backfloating might have been possible. IIRC anteaters sometimes walk along streambottoms, this sloth may have done that too. - "The later spp of Thalassocnus show no sign of pachyostosis as found in other aquatic bottom-feeders": faster swimming? less salt waters? deeper diving? less bottom-feeding? more terrestrial/arboreal? - "Many aquatic mammals, such as cetaceans and sirenians, have almost entirely lost their hair in favour of an insulating fat layer" but AFAIK Sirenia (& hippos) don't have fat layers: cf warm waters? - Fur & SC fat have different functions, so "in favour of" is not correct here: most mammals are furred & lean, and Cetacea are furless & fat, but most pinnipeds & mammoths are/were furred & fat, and seacows, elephants & hippos are furless & lean AFAIK. 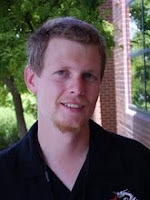 Fossil skeletons of Homo erectus and related specimens typically had heavy cranial and postcranial bones, and it has been hypothesised that these represent adaptations, or are responses, to various physical activities such as endurance running, heavy exertion, and/or aggressive behavior. According to the comparative biological data, however, skeletons that show a combination of disproportionally large diameters, extremely compact bone cortex, and very narrow medullary canals are associated with aquatic or semi-aquatic tetrapods that wade, and/or dive for sessile foods such as hard-shelled invertebrates in shallow waters. These socalled pachyosteosclerotic bones are less supple and more brittle than non-pachyosteosclerotic bones, and marine biologists agree that they function as hydrostatic ballast for buoyancy control. This paper discusses the possibility that heavy skeletons in archaic Homo might be associated with part-time collection of sessile foods in shallow waters. Perhaps the marine sloth fed upside down (face towards bottom), in thick forests of stringy vegetation (rather than the skimpy veg. shown at top picture), grasping bunches of anchored weeds with all 4 limbs and using relatively long flexible neck (compared to modern sloths) to both nibble and to reach up to breathe; modern sloths have a slow metabolism, maybe the marine sloth did also, allowing smaller longer breaths so not requiring dense bones for ballast.